A plant that can take about a decade to produce a flower that emits a scent akin to rotting flesh is set to bloom this week at the Toronto Zoo – years ahead of schedule. The corpse flower, a native of Indonesia, will bloom for just eight to 36 hours sometime this week, said the zoo’s curatorial gardener, noting that when in full bloom, the plant produces one of the largest and smelliest flowers in the world. A corpse flower is seen in this undated handout photo. The plant at the zoo is only five years old, but Gellatly said he knew something unusual was going on based on what he saw over the past few weeks. A month earlier, the leaf portion of the plant began to die off and recede into the corm, an underground plant stem. Such plants then produces more leaves or a flower, never both, he said. But the plant at the zoo showed signs of flowering, despite its young age. Gellatly said he then sent off numerous pictures to colleagues at the New York Botanical Garden to be sure the plant was about to flower before the zoo went public. “This is the first one I have seen gone to flower,” he said. The plant is native to the jungles of the Indonesian island of Sumatra and smells like rotting meat while blooming, which attracts carrion flies and beetles for pollination. The flower will smell its worst on the first night it blooms, Gellatly said. The flower is threatened in Indonesia and will become the first in the Toronto area to ever bloom, he said. The zoo has 14 corpse flowers of various ages, but this is among a group of the oldest. A corpse flower recently bloomed at Edmonton’s Muttart Conservatory. The two have great differences in mass, Gellatly said. 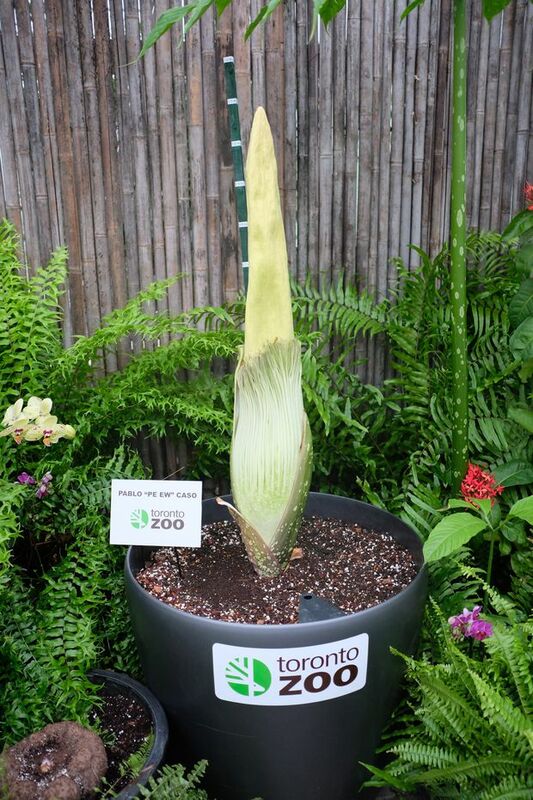 The Toronto Zoo’s corpse flower bulb weighs 24 pounds while Edmonton’s came in at a whopping 200 pounds, he said. The zoo has dubbed the Toronto plant “Pablo ‘Pe Ew’ Caso” after a naming contest. It has been moved to one of the zoo’s production greenhouses for display from its usual spot in the Indo-Malaya pavilion and visitor hours will be extended so members of the public can see the pungent plant in bloom. A corpse flower also bloomed in Vancouver earlier this year. In July, that plant – dubbed Uncle Fester – flowered at the Bloedel Conservatory in Queen Elizabeth Park, drawing thousands of visitors.